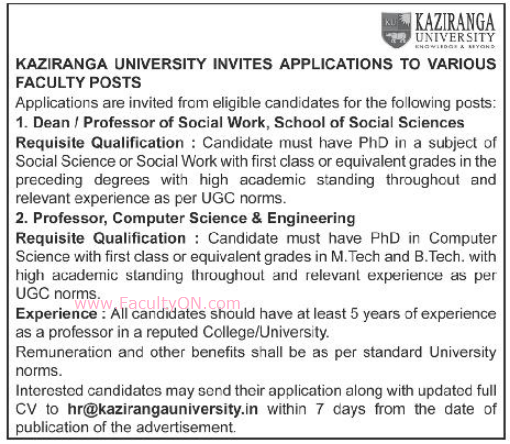 Kaziranga University, Jorhat has advertised in the SAMAJA newspaper for recruitment of Teaching Faculty - Professor / Dean jobs vacancies. Interested and eligible job aspirants are requested to apply within 07 days from 12th October 2018. Check out further more details below. About College: Kaziranga University, officially established as The Assam Kaziranga University, is a Private university located in the city of Jorhat in Assam, India. It was established in 2012 through The Assam Kaziranga University Act, 2012 created under Assam Private Universities Act 2007. How to Apply: Interested and eligible candidates are requested to send CV, copies of certificates / testimonials and recent PP size photos to the email address provided here.